My teenage daughter plans to take AP Calculus. Ambitious, but I have no doubt she’ll do well. I took the same class back in high school, but I’ll be honest. Today, anything with numbers, graphs, and spreadsheets scares me. That’s why I’m a social media marketer – I don’t enjoy math! So imagine the horror when I realized a component of successful social media (and content marketing) was measurement and ROI. I’m a lucky one. I don’t have to convince my team of the value of social media. But I still want to be able to explain our strategy and its ROI in a compelling way. It not only makes a strong case for continued investment in social media. It also helps me determine what content is performing well. Calculating ROI does not need to be difficult. So I thought it would be great to have an open discussion with the #CMWorld community. I wanted to talk about social media and its impact on your brand’s bottom line. Our chat sees some of the best in the business. And this week, they did not disappoint. What follows is a quick look at the conversation. If you’d like to see all seven questions and their responses, check out our Twitter Moment. Side note: Social media ROI is a timely subject for me. Now it’s your turn. What’s on your mind? 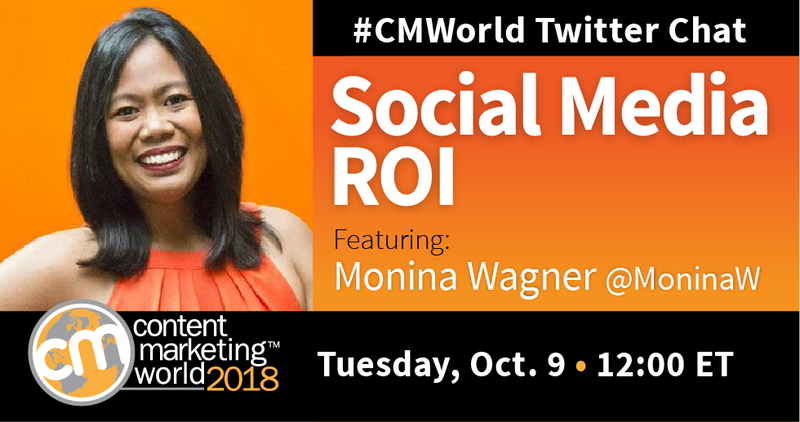 Do you have a topic you’d like to see covered on an upcoming #CMWorld Twitter chat? Let me know! Why is it important for marketers to measure social media ROI? Is there a true formula for calculating social ROI? How do you measure it? What tips do you have when it comes to social ROI? Are there tools that make it easier for you to report? Let us know in the comments below. And in case you’re wondering – yes, Excel is growing on me. I bet you’ll like it too once you see how your social media is paying dividends into the future. Want help securing buy-in for a content marketing program that delivers ROI? Attend our Master Class, coming to a city near you.